Plastic sheet and rod products specifically developed as timber and steel alternatives for rural applications. 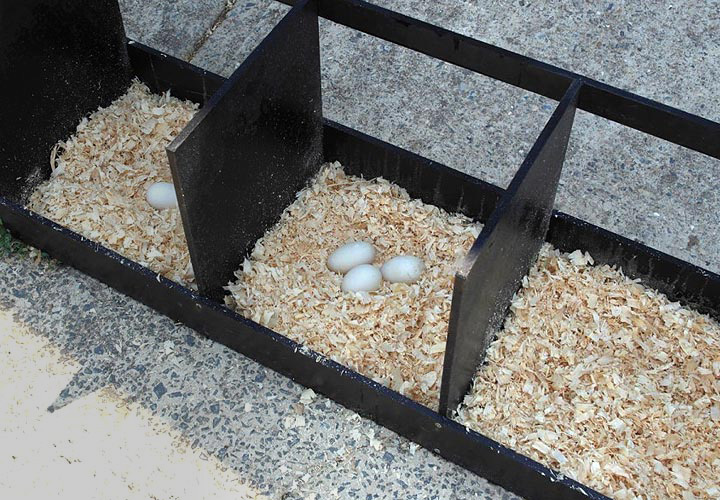 Our products are made from a high quality polymer that is ideal for the replacement of timber & steel on farms, equine environments, dairies, piggeries and other agricultural related businesses. There are a vast number of applications across the Agricultural Industry that Dotmar has grown over many years of experience. Our range of products can withstand the harsh New Zealand climate and will never rot, harbour disease, rust or get eaten by insects or rodents. 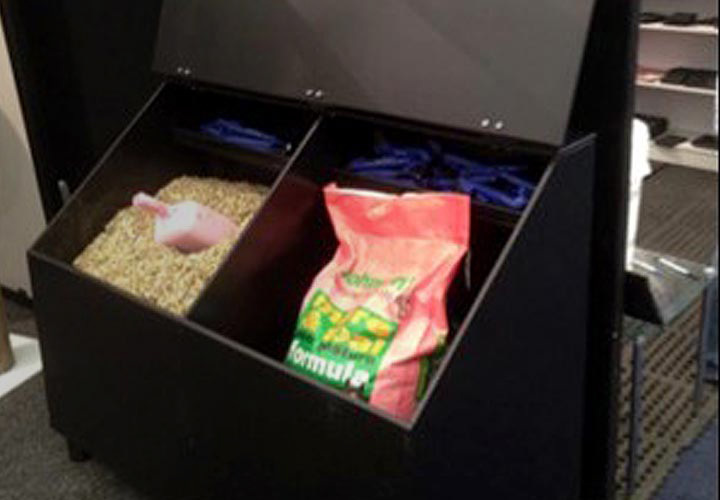 Dotmar Agricultural plastic products are one of the safest products to be used around animals. Our range of 100% waterproof products can easily replace old rotting timber around the property without having the need to ever replace again. Dotmar's Uniboard products were specifically developed for use as timber replacement material. Perfectly suited for replacing old, rotting and flaky timber within the agriculture, equine and construction industries. These products eliminate the current need for any on-going maintenance programs. Uniboard will never require painting, will never be attacked by termites or other insects, will never absorb smelly animal urine and just as importantly does not carry diseases. This makes both products ideal in controlling your biosecurity requirements within a farm and stud environment. Uniboard are 100% non-water absorbent products, they are UV resistant to cope with the harsh New Zealand conditions and look great! 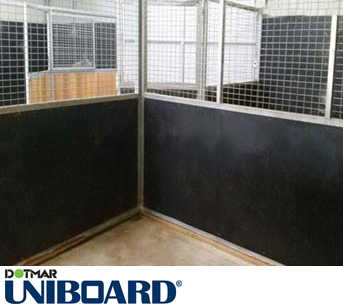 Dotmar's Uniboard products are well suited in high impact areas where large animals like horses and cattle are more prone to causing impact type damage from kicking and pushing. The long term benefits of using Uniboard material far exceed the lifespan and durability of any wood based product in the market today. Please contact your Dotmar representative on 0800 650 750, to assist you in selecting the best suited product for your application. After the industrialisation of land work, processes that were manual in the past have been automated gradually and modular belts have greatly contributed to it. 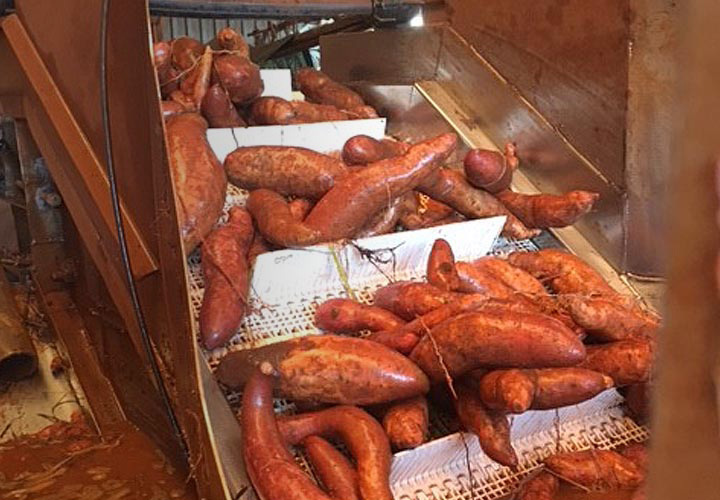 Present even in the product harvest, placed in mobile trailers to make the first selection, they convey the vegetable products during all the production process: washing, selecting, blanching, boiling, cooling, bagging, etc. 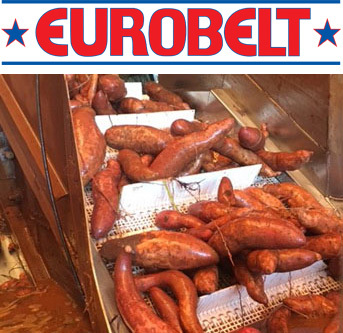 Since these products bring with them abrasive elements, like mud, stones, and sand, EUROBELT, in collaboration with its plastic raw material suppliers, is devoted to the continuous search of materials more resistant to abrasion in order to achieve a longer life for its belts. 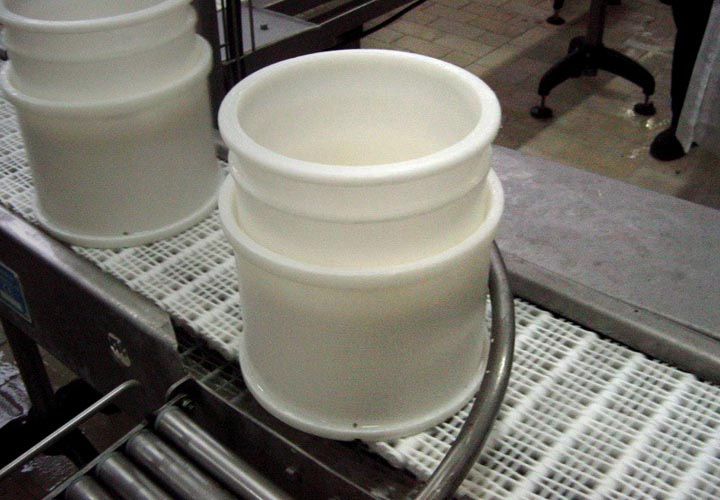 One of the dairy processes more mechanized lately is the cheese manufacturing on a large scale. At the beginning stainless steel metallic belts were used, but they became deformed due to the weight of the heaviest cheeses, and they had problems with regard to the maintenance. Moreover there were problems concerning the final quality of the product, because the friction of the metallic belts on the sliding surface, even when it was plastic, formed a kind of black paste, due to the existing animal oil, that stained the products causing their rejection by the quality control. 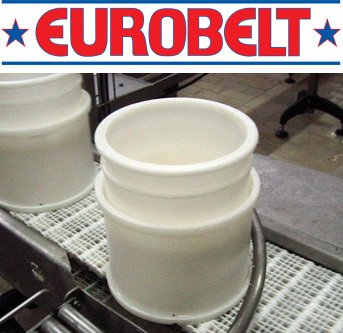 Our E50 FLUSH GRID belt has proved in many installations that nothing of this happens when using our plastic modular belts.They are placed in brine pools, presses, mould elevating conveyors, and in every conveyor required in the production line, achieving an unrivalled performance. The current methods for producing wine are far away from those used by our ancestors. Nowadays, derived from complex and costly technical studies, meticulous systems of detailed care are carried out regarding the soil, the plant, the fruit, and of course, its transformation in wine in order to obtain the best quality. 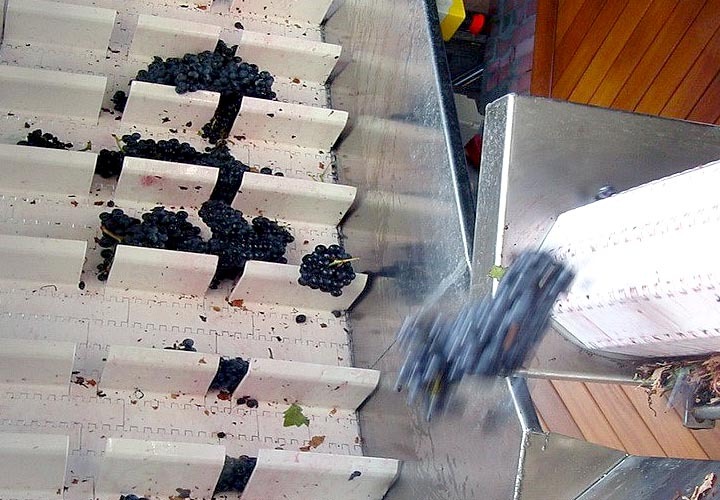 But for all these, it is essential a conveying and handling aseptic system for cooling the grapes, selecting them, and carrying them to the destemmer with the care and asepsis required by the most demanding quality control. 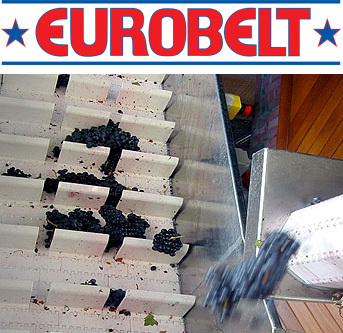 Our modular belts have been carrying out this task in this selective industry successfully for some years, so that they are installed in the most famous wineries.